The easiest way to show you the differences are in a side-by-side comparison. There are so many ways for you to “pay” for your card that you really have to read the fine print. Start by comparing the “Fed Box” information required by law. The box on the left is the current information from Destinations Credit Union. 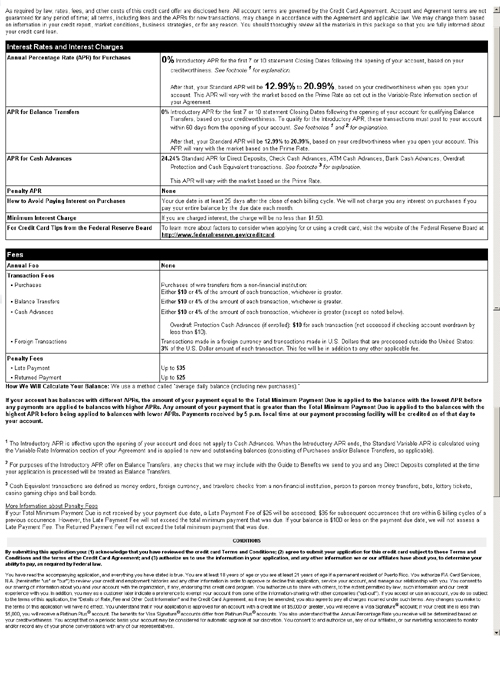 Below is the information from the same day (10/14/2010) from a major bank. Although this is a real bank, we’ll call it “Big Bank USA” to protect the not-so-innocent. Both the bank and Credit Union offer no annual fee and a 25 day grace period on purchases. Big Bank USA has higher rates than the Credit Union, though they are offering a teaser rate of 0% for the first 6 months. After that, they revert to the higher rate and you can see that they are much higher for cash advances. The Credit Union offers the same rate for cash advances and purchases. These higher rates and fees will add up to more than you’ll save on a teaser rate in many instances. 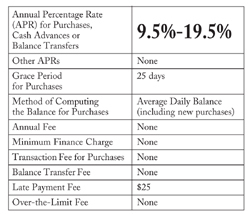 Big Bank is going to charge you 4% or a minimum of $10 if you transfer balances on to that card. That means for every $1,000 you transfer from a higher rate card to this one, you’ll pay a $40 fee. At the Credit Union, there is no balance transfer fee. Credit Card Connection lists fair and ethical cards by the state in which they are issued (Destinations Credit Union is proud to be on their “Dean’s List“). The credit card world can be pretty creepy, so shoppers beware! Halloween is coming up and this article is being written to shed light on the scary practices of some credit card issuers. Before you know it, Thanksgiving will be here and then we’ll rush full-blown into the holiday season. For many of us, that means using our credit cards more. There are some things to be aware of and beware of before you trot out that plastic on your holiday shopping spree. ….and not just your credit limit. Don’t spend more than you can comfortably pay for in a reasonable period of time. Spreading the cost of the holidays over 2 or 3 months may make sense to you, but if you’re still paying for this year’s gifts by next December, you may have a problem! Sweeping credit card legislation enacted this year has many credit card issuers looking for new and inventive ways to part fools from their money. There are all kinds of ways for issuers to make up for the income they’ve lost through the Credit Card Act. Other issuers are closing accounts that are not profitable for them and that can affect your credit score. While it is difficult to gauge the exact affect this has on your score, closing card that you have had for a long time will negatively impact you. In addition, closing cards may negatively affect you by lowering the difference between your credit limit and actual credit used (smaller overall credit limit while your balance remain the same). To offset that change, you could request a higher limit on the credit card(s) you are keeping. Higher and new fees are other ways credit card issuers are using to make money. Among the items reported are fees for foreign transactions or higher balance transfer fees. Some have begun charging annual fees even if they offered no annual fee before. Some are charging fees if you are inactive or pay off your balance every month. At least one large bank is charging monthly fees for participating in the rewards program. Others are taking away rewards altogether, or removing rewards if you are late on a payment. You should also pay attention to whether the APR is a “fixed” or “variable” rate. A variable rate that may look very attractive now (when rates are at their lowest point in recent history), may not be so attractive as market rates start to rise.